As our Blessed Mother stood before the Cross of her Son, she had three long hours to ponder all the powerful moments and experiences of His earthly life. 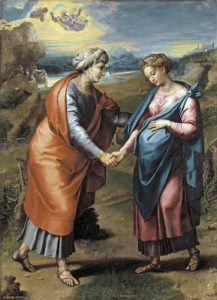 Perhaps her mind would have gone back to the beginning when Saint John the Baptist testified to Jesus from the womb of Elizabeth. Saint John sensed the presence of the Savior of the World. He was not able to understand this mystery fully with his mind, but he understood the mystery in his spirit. Joy touched him and he leaped. This was not a willful response on his part, it was an inspiration from the Holy Spirit. He received this gift of joy and responded from within the womb. Elizabeth sensed that joy and she expressed it to the Mother of God and to all of us. As our Blessed Mother gazed upon her crucified Son, the joy of that moment, experienced so many years ago, would have brought her peace and consolation. The Father had not abandoned her Son on the Cross. How could He? How could the Father and the Holy Spirit be absent from this moment? It was the Holy Spirit who inspired Saint John all those years ago with joy, and now it was the Holy Spirit, once again, who was inspiring Jesus’ mother with a joy that transcended even her Son’s death. As Mother Mary gazed upon her crucified Son, her joy would have resulted from the simple fact that she was gazing upon her Son. She saw His divine soul under the veil of blood and bruises. Despite the horror of the Crucifixion, the joy of His Incarnation could never be erased. He was God and He was also her Son, her flesh and blood. What a joy, what a blessing, what a gift! Reflect, today, upon the fact that God is present to you always, no matter what you go through in life. Even in the midst of the greatest sufferings, God is present. His presence is worth rejoicing over. This joy overshadows anything and everything we encounter in life. Let the joy of the presence of God enter your heart this day as you gaze, with our Blessed Mother, upon the suffering of the Son of God. Dearest Mother, your eyes beheld the greatest horror ever known but your heart leaped for joy. The joy you felt was a result of the holy and simple fact that no matter what they did to your Son, He was still God and He was still your Son. His presence always inspired hope and joy and nothing could ever take that away. Dear Mother, pray for me that I may keep my eyes on the divine presence of your Son, no matter what I endure in life. May that divine presence be the joy that enables me to rejoice always. My most precious Savior, no matter how beaten and bruised You are, I rejoice in Your divine presence in my life. I rejoice in Your Incarnation and union with me. May I never allow the joy of Your presence to be overshadowed by the sufferings of life. Pray for me, dear Mother. Jesus, I trust in You.